Today, I feel a bit fuzzy. I’ve been working and working on a short story, and the best writing time hit in the middle of the night. A few nights going to bed at 3 or 4 am can seriously deplete your energy. Yesterday I read that beat up draft of my unicorn story to my writers’ group. There’s something about this story I love, like LOVE LOVE. Is it the unicorn aspect, a unicorn with a dark twist? Maybe. Is it the theme that there is no happily ever after, only moments of joy that drive you to search for more? Maybe. I want…I need it to be good. Submissions for the anthology open on September 1, and I would love to see it published. So I was extra nervous to read it. As in I thought I was going to throw up nervous. Oh. Wow. Only on page two…this feels so long. Geez, me, can you repeat that word any more? I think I already said something similar to that…DID I SAY SOMETHING SIMILAR TO THAT? Ugh. Repetitive much? Oh. Yes. Too long. Dragging. Tension…all the tension. Too much tension? Is anyone understanding what I meant there? Hmmm…that scene, I thought I deleted it? Why didn’t I? SHOULD I HAVE DELETED THAT? Everyone is really quiet…maybe they fell asleep…OMG THEY FELL ASLEEP THIS IS BAD! I’m sweating…I think I’m sweating. Do I smell? Oh. More words I obviously can’t live without. Maybe I should go home and burn this. Seriously quiet in here…no one is moving. I think I killed them. Aren’t I done yet? This is so long! Almost done. THEN WHAT WILL EVERYONE SAY??!?!? LAST LINE THANK GOODNESS I’M DONE! Of course as everyone commented, my brain spun a million miles an hour, deciphering what they said, translating their thoughts into what it meant for the story. What did they hear? What did they get from the story? What did they like? What did they not understand? Did these words do the job I wanted them to do? Yes. I had positive feedback. The story is there, I just have some problems to fix…problems I knew existed, because, dude, I do those things all the time. Repetition is a fun thing I do. Beginnings, not my forte, I need to add a bit. I think I have a good opening line and closing line…SO YEA THESE ARE IMPORTANT TO ME! AND THE GRAND POOBAH OF ALL…the message was in there. Those listening got the point of the story. Anyone else have similar experiences? Anyone else send work off to be read, or read it in front of people and feel like they’re going to explode? My guess, pretty much everyone. Our work, our art, is a bit of ourselves and we want to be liked, we want to be good enough. This is a good thing. It makes us strive to be better, to learn. Now I will take what my notes and see what will help my story and what won’t. But I’m not going back to revisions for a while. Like I said, my brain is mushy… *pokes it with a stick*…yup, mush. And perfect timing, I leave for vacation on Saturday and will be gone for a week. So today and tomorrow will be me crossing the I MUST DO THESE THINGS BEFORE I LEAVE off the list. And because I will be out of the state visiting family, I will be absent from here. DON’T CRY I WILL RETURN! When I tell people that I like teens best, I’m pretty sure they think I’m being sarcastic. But I’m not. Remember being a teenager? It sucked. I would never go back. NEVER. I love to talk to teens and watch other adults interact with them. I have two teenagers myself, it’s the best. I am a fairly hands-off type of parent. As soon as they could put on their own clothes, I was done involving myself with what they wear. As soon as they could put food in their own mouths, I happily let them take charge of eating. When they went to school, I helped where I was needed, signed what I had to, but their work was all on them. I’ve never said…clean your room, did you get your homework done, or no, you can’t spend your money on that. I believe in choices. I believe making our own decisions is key to becoming the best people we can be. If we mess up? We deal with the consequences and we learn. Do I want to see my kids hurt or fail or end up on the wrong path? Nope. But I will let them. Because seeing them get back up on their own, seeing them find the way that works for them, and watching them become more confident with each step pretty much makes me the happiest. Struggle is what being a teenager is. This is why they’re my favorite. This is why I write for them. Because the fight is real. Teens might not have a mortgage or full time job, but they have their own problems, their own lives. The in-between stage of life is an important part of the journey, one where they test the waters, test themselves, face fear and uncertainty. Never belittle it by lecturing, by telling them they’ll understand when they’re older. Stuck somewhere between childhood and being a member of adulthood is painful, and the more tools in their arsenal the better. They want to be independent. They want to be in control of everything, but they’re not. They’re living at home, with rules they think they don’t need and parents telling them what to do. Don’t get me wrong. Rules are good. I have a few of those. Teens look out at the world with the fear and excitement at having to one day enter it. Parents are guides. We are there to show them options, and not to hinder their choices…to share our opinions, but not to get in the way of them forming their own. Recently, I watched adults offer their opinions to a teen. This nineteen year old has had some problems, he’s gone against what he’s been expected to do, made choices that have caused big issues, and his past holds a deep sadness. He’s struggling, trying to find who he is and what he wants in this great wide world. I watched him shut down as the opinions flew. I watched his gaze drift to the window. Whatever he was thinking, he held it in, knowing it would lead to arguments. Phrases I heard over and over. Phrases that make me cringe. What does he want? I don’t know. I don’t think he does, which is the joy of being that age. But I don’t think he needs people telling him what to do. I know they want to help. I know they don’t want him to fail. I know they are imparting wisdom that only comes with age. But wisdom can’t be given…we all have to find the knowledge ourselves. He, and all teens, need a bit a freedom to find their way. We, as adults, as parents, have to be able to let go of our fear, that they’ll fail, be unhappy, or worse, and let them live…let them become who they are meant to be. I am not telling people how to parent. Dude. I have no idea what I’m doing most days. We all have to do what works for us, with all our differing personalities and opinions. And I am prepared to hear from all the parents who want to tell me that if they let their teens make their own decisions the world would explode. Go for it. I ask people to think. Letting teens have moments that are their own, letting them be in charge of their destinies, will help them when they go out into the world to create their own lives. Cause my goal is for my kids to leave and not come back, well, maybe for visits. I’m not a big supporter of change. It scares me to be honest. Most of the moments when life switches directions, it’s out of our control. We hang on for the ride, doing the best we can to make it work, to keep smiling and keep living. There are other times when we seek out change. I am standing at one of those moments, staring at my life wanting something more, something different. What will that be? I don’t know. It could be as simple as a new haircut or a fancy schmancy shirt. The need for change happens to me when I find myself in a happy place. When all the strangeness of life balances to a point where I don’t feel like I’m not doing enough, like I’m not good enough. Right now, I’m not drowning. I’ve accepted my imperfections, embraced what I can do and let go of what I can’t. I’ve allowed myself time to keep up with yard work, the pool, working out, housework, spending time with the family, and writing…as well as getting the kids to band practice and ball games. This peace won’t last forever, it never does, so I’ll enjoy it. And because I kinda like myself now, I want something new, something to show that I am kinda awesome and express me being…well, me. The world is also standing on the edge of change, searching for a way to be better, demanding more of all its people. My hope, that in this crazy world of political insanity and meaningless actions, we can all find that happy place, find peace and learn to like ourselves enough to seek out change, a something new that brings us joy. Peace to all who have none. A somewhere better for those who have had their lives stolen by disease, by mental health issues, by the evil acts of someone else. The ability to be exactly who you are without fear of judgement. With change, we will rise above the darkness, but everyone in their own way, in their own life… and bit by bit light will spread into the world. Change can be scary, but is necessary and can also bring greatness. We’ve seen it throughout history. Love yourself. If you can’t, find help. Love others. If you can’t, find a way to accept, to not judge, to let everyone chose their own path to happiness. Last weekend was out small town’s summer festival. 90 degree weather. Sun. People. Games. And a parade. I love it. Small town summer all wrapped up in sweaty, sunburned people, in fried food and games where you can win Dum Dum suckers. When I was a kid, in the suburbs of Peoria, Illinois, summer meant the Heart of Illinois Fair. The demolition derby. Manning the photography exhibit with my dad (and entering my photos, one of which won second!). The smells of fried food. The mid-way. Tractor pulls. The dancing fountain. WONDERFULNESS! Those once a year traditions make me smile. The special moments when people come out of their air conditioning and celebrate their communities make the world happy. Let’s face it, the world needs happy. A lot of it. The world needs people smiling. It needs good feelings. It needs people getting together in peace. And I pray for those who don’t have that peace. But last weekend was even more than that…for me. 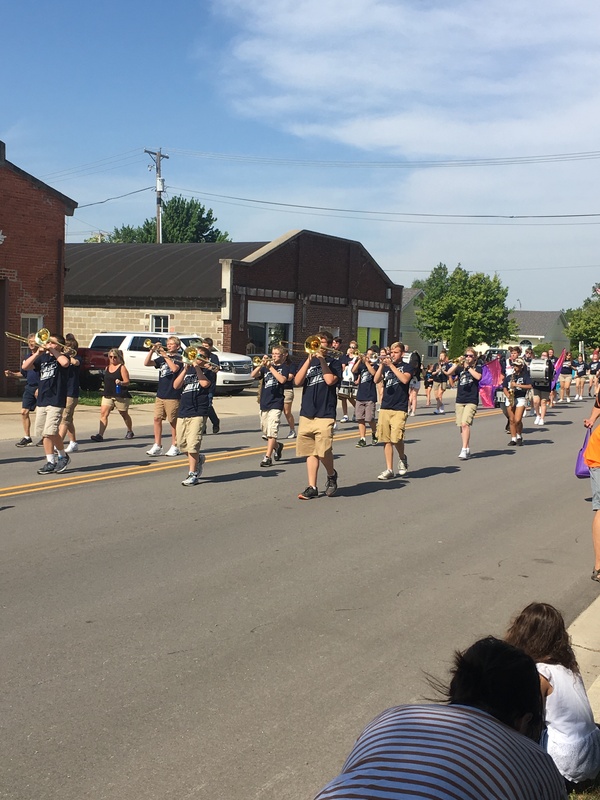 My 13 year old daughter marched in her first parade as a member of her school’s marching band, The Spirit of Woodlan. She came to me at the beginning of her fifth grade year and told me that she went to the band teacher and asked about playing the trumpet…on her own. I had no idea she was interested in playing an instrument. So, she was offered a school trumpet to play, and she would get up early everyday to go to band practice half an hour before school. Without complaint, she went to band every morning of her fifth and sixth grade years. 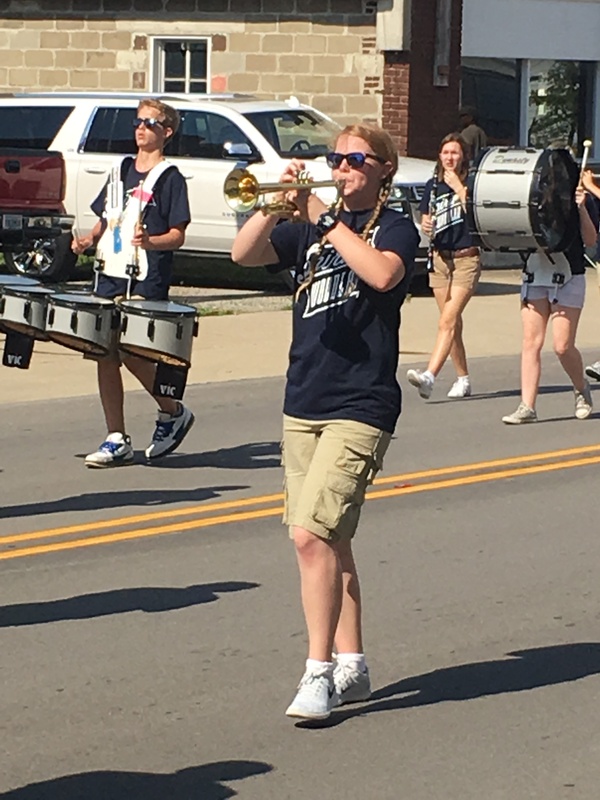 At the end of her fifth grade year, she told us that the trumpet was awesome, that band was the best and she was sticking with it. So we bought her her own instrument. SHE DECIDED TO JOIN THE MARCHING BAND THIS SPRING! I have no idea what being a band-mom means, but it’s scaring me a bit. BUT I WILL DO ANYTHING FOR MY MUSIC-LOVING KID WHO LOVES BEING A PART OF THIS GROUP! Well, in June she practices from 6-9 pm, four times a week. She gets a break, then at the end of July brings band camp…five days a week, two weeks, 8-4. Memorizing music. Learning to walk (the correct way) and play at the same time. And as soon as school starts, practicing for five hours after school and learning a routine to perform at football games and band competitions. Dude. That’s. A. Lot. Of. Work. AND SHE IS SUPER EXCITED! Well, she can march and play at the same time. And her first parade was a success! I was a proud, PROUD girl watching my daughter strut along the parade route looking cool and super awesome. PLAY THAT TRUMPET FOR THE WORLD TO HEAR! Fill you life with the things that bring you joy, when the pleasure of that hobby or job outweighs the thought of hard work. If we all focus on the joy of our lives…of LIVING…then bit by bit, we erase the darkness of the world. We can stop evil with our light, beginning with simple things like music and the marching band. Today is the day when authors will fill Twitter with 140 character pitches of their shiny manuscripts hoping to catch the eye of agents and small presses. #Pitmad has grown tremendously over the years I have known about it. Even though I am not participating, I have in the past and understand the craziness, the nail-biting hopefulness, and celebrating/disappointment that will occur all day today. Authors wait for that notification that someone…ANYONE…liked their tweet. If you are unfamiliar with this event you can find all the information about PitMad here, Brenda Drake’s blog…the woman responsible for the event, for bringing writers together, for introducing a fun way to maybe find an agent or publisher. BEFORE you tweet a pitch or even hit any buttons in support of your Twitter friends…READ THE RULES. It’s worked for so many…not for me, but that wasn’t meant to be my path. However, my not participating doesn’t mean I won’t be scrolling through the #PitMad feed, reading all the pitches. For those that intrigue me, I will send good luck wishes via fairy dust by replying, NOT FAVORITING AND NOT RETWEETING (I solemnly swear). I mean think of it, a list of potential books THAT MIGHT SOMEDAY BE SITTING ON A SHELF! It’s exciting. And, for the authors, terrifying. Putting those carefully honed pitches out there is a brave move. Heck writing a book is one heck of an accomplishment, one that saps the very soul. But what if no one likes your tweets? What if you send the words into the Internet void and…nothing? I’ve been there. There are a lot of pitches. So many, it’s easy for yours to get lost, for eyes to skip over yours in the blink of a tweet. There are new rules to help declutter the feed, to help the agents find you, but there’s no guarantee. WHAT MAKES A TWITTER PITCH STAND OUT? No one knows. There are guidelines. There are plenty of people who will critique them. There is a plethora of advice floating about in the Twittersphere. There are definite things to have in those precious 140 characters. #Pitmad…if this isn’t in the tweet, it won’t be seen. Your category and genre. There’s a list on Brenda’s blog. #YA #F…#A #H…#MG #SF…These help agents and publishers find what they’re looking for. And you want them to find it. The rest is up to the author. 140 characters is not a lot ACTUALLY IT IS PRETTY MUCH NO SPACE AT ALL HOW IS THIS POSSIBLE? But people do it, some do it pretty darn well. So consider…What will make someone want to read your words? Show what makes this work unique. Writing a Twitter pitch is harder than writing the manuscript. I will be watching off and on all day…checking on friends’ tweets, cheering on those I like, and holding my breath FOR ALL OF THE PITCHERS! Because what makes writers great is the fact that we support each other. There will be favorites. There will be agents and publishers eagerly hunting for their next acquisitions. From those favorites, there will be submissions, then rejections or requests for fulls. And months or years from now we will learn the outcome of the days events. But in the end, so many friends will be made today. So many connections will happen. Authors will learn and grow, taking another step on the path to publication. THIS IS THE TRUE MAGIC OF #PITMAD! Good luck to all pitching today! I will be cheering from the sidelines. Lately, I have become afraid to write characters who come from different backgrounds, cultures, abilities, or lifestyles than I do. I know… a little dramatic. But sometimes we need to laugh, so we don’t lose our minds. Will someone read it and hate me forever? What if I could have done it better, differently? This thinking (overthinking) will stop all the writing. Twitter is full of advice, well, opinions on this. So many people telling groups that we need diverse characters, but those groups can’t write them. I’m all for diversity. Everyone’s stories have an important spot in the world. And everyone has the right to tell the story in their own way. So many books, so many characters and so many opinions about them. But there has to be a level of acceptance. You can’t make everyone happy. Though we try. One person finds something they don’t like in our work and we bend over backwards to “fix” it, and it might not be broken. I dislike…A LOT…when people discuss what could have made a book, movie, story, TV show…or any art better. Feel free to disagree with anything out there. Feel free to voice your opinions about why certain things bother you. But DO NOT state how to “fix” it. Let me say that again…IT’S NOT YOUR ART. If you think a premise, a character, a story would have been better written a different way…WRITE IT YOURSELF. Don’t bash the author for what they “should” have done. Artists aren’t here to give you the art you want, to paint the world in your favorite colors. They are here to offer their views, to share how they see the world, and incidentally share parts of their worlds with you. Do we need to worry about offending people…Yup. Writers need to do their research if delving into a subject they know little about. Other countries, other cultures, religions, people outside your sexual orientation all need to be represented as honestly as we can get. And stereo-types? We need to break those suckers apart. But writers have no obligation to write their stories or characters to anyone’s specifications except their own. As long as the character is honest and consistent, to himself and the world, as long as the words weren’t written with malice…there needs to be an amount of acceptance from those who find offense, who don’t agree with how it was written. Accept the other person’s views. Accept how they decide to portray their characters. They did not write it to offend you or anyone else (and if they did, well, that’s a whole other thing). Most of us out here do not want to offend anyone, but we do not want to tip toe around trying to avoid possible trouble. We want to write the stories that appear in our minds. We want to portray our characters without fear of being hunted down and hung before the masses. A lot of worry. A lot of overthinking. A lot of feeling not good enough. I’ve decided to let the fear of doing wrong go. Will my book offend someone? Maybe. Probably? I have no idea. I accept that. I also accept that I am writing without any hate towards anyone. I am writing my characters and my stories the way I want to tell them. My characters will express themselves the way they need to, for the story. My character is not intended to represent a group of people. If people don’t like it? Okay. If you want to tell me why…GREAT! I will listen. I will take those opinions and learn…grow, but I can’t guarantee those opinions will change what I write. Because my words, my characters, my worlds are mine.